The Justices for Glamorganshire had originally intended to build an asylum in partnership with Carmarthenshire, Pembrokeshire and Cardiganshire, but those plans fell through, and those counties would eventually end up building what became St David’s Hospital at Carmarthen, which opened in 1865. With Glamorganshire now set to build its own asylum, a site was found at Angelton, in what had once been the grounds of Margam Abbey, and later a part of the Penshurst Estate. The Glamorganshire County Lunatic Asylum (aka Angelton Asylum) opened on the 4th November 1864, with room for 350 patients. It was designed in a muted Victorian Gothic style to a linear corridor plan, by Bell of London along with Martin and Chamberlain or Birmingham, and built by Barnsley & Co. of Birmingham from Coombdevon, Bath and Forest of Dean stone and Red Gloucester brick. The asylum was established with a view to a progressive regime, and the first Superintendent, Dr David Yellowlees, oversaw one at which a non-restraint policy was immediately in use, there were signing classes on Tuesdays, dances in the recreation hall on Thursdays, and cricket on Saturdays. By 1871, the population had risen to 444, nearly 100 above capacity, and so new wards were added, within two years they were full, and it was up again to 478, and to 557 by 1875, which saw beds being set up in corridors and even put in the Committee Room. By 1880, patients were needing to be boarded out to other asylums. Despite this overcrowding, the non-restraint policy remained under second Superintendent Dr Henry Pringle, and patients enjoyed a greater degree of freedom, as well as time at other activities away from the asylum than many patients at similar institutions could often expect. 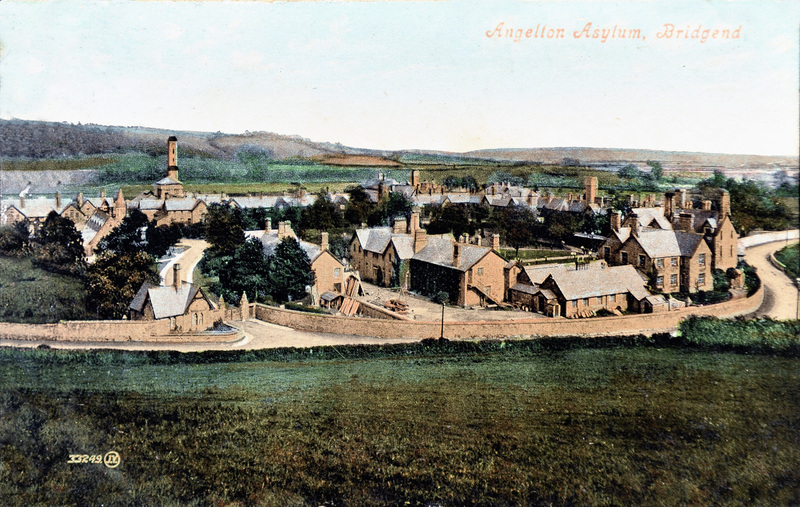 The much larger 2nd Glamorganshire County Asylum (later Parc Gwyllt Hospital) was built nearby, and opened in 1887, allowing the one at Angelton to settle its numbers and become more manageable from then on. In the First World War (1914-1918), the large Cardiff Borough Asylum (later Whitchurch Hospital) was emptied for use as a military hospital, with most patients being sent to Angelton and Parc, which led to overcrowding again, as well as the need, in a time of extreme under-staffing, for the wards to be locked and additional activities to be curtailed. In 1922, the two asylums, although very much separate buildings, were merged as an institution and became the Glamorgan County Mental Hospital, with 2,165 patients spread between them by 1930. An outpatients clinic was established at Bridgend in 1934, and another large building named Penyfai opened nearby, primarily used as an admissions and observation hospital for the other two. In 1948, the mental hospital came under the umbrella of the new National Health Service, which saw a name change for the Angelton buildings to Glanrhyd Hospital (Glanrhyd meaning “shore of the ford”). Parc Gwyllt, which actually meant “wild park”, while never intended to be at all inappropriate, was perhaps wisely shortened to simply “Parc Hospital”. The Management Committee that now oversaw both buildings (as well as the Glamorganshire Mental Deficiency Colony at Hensol) would eventually see the Bridgend site known collectively as Morgannwg Hospital by 1949. These changes to the site of three buildings, which now also included the smaller Penyfai Hospital and has also been referred to as the “Bridgend Cluster”, has caused some confusion around nomenclature over the years, so for clarification, there were three psychiatric hospitals at Bridgend by 1948, Glanrhyd, Parc and Penyfai, which were now collectively known as Morgannwg Hospital, accommodating over 2,000 patients between them by the early 1950s. An outbreak of smallpox in 1962 saw the hospital close itself off from the outside world, with visiting stopped temporarily, and 80% of the staff and patients given vaccinations – those who were not vaccinated were considered too old or infirm to withstand the process. An elderly female patient was found with a rash, and the entire ward was sealed off, which seemed to have the desired result, as there were no further cases. Efforts to reduce patient numbers across Morganwg had been largely unsuccessful during the 1950s and 60s, and the population of the three hospitals still totalled 2,200 by 1965, but had finally dipped below 2,000 by 1966, although that figure was still considered to be 236 more than could ideally be accommodated. With constant rearrangements of management structures througout the 1970s (which included the division of Glamorganshire into west, mid and east divisions), the patient population fell further, in line with the national strategy to reduce patient numbers significantly. Glanrhyd is one of the handful of former County Asylums still active in mental health use, and although there has been some demolition of and alteration to the original buildings, the majority survive in use. A new £16.4 Million low-secure unit was opened on-site, just next to the 1864 buildings, 150 years later in 2014.
my father got himself admitted here , he bull shitted his way out of facing the punishment for beating my poor mother . he is a horrible abusive bully who will never own up to the way he treated my mother . even in death he had the last word burrying her in his family grave going against her life long wishes to be laid to rest with her mother. SHAME ON YOU the devil is waiting for you………………….